Lev Manovich argued that we have shifted from a state of new media to one of 'more' media. There is simply so much media these days (the product of new technologies and social interactive forms) that it is humanly impossible to gain an overall perspective. Our only viable option is to draw upon the quantitative methods that have driven contemporary science and business ... Manovich's lecture, delivered to a packed audience, resonated very much with my experience of ISEA2008. 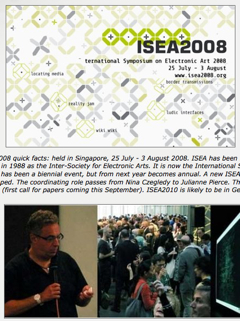 With its 800 delegates, five concurrent streams, juried exhibition and huge range of associated panels, seminars, workshops and exhibitions, ISEA2008 was anything but digestible.